Gender: Male Class: Adept Rogue (MultiWeapon in Japanese) Real Name: Ryou Misaki Age: 17 Avatar: The Terror of Death, Skeith Height: 174cm In .hack//Roots, Haseo is a newbie player to the Online game known as The World. He is an outcast in real life, and not very good at dealing with people. Upon logging into The World R:2, Haseo is attacked by PKs, (Player Killers), and rescued by Ovan, the Guild master of the Twilight Brigade. 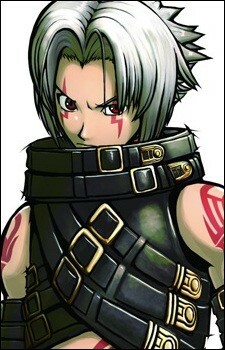 Haseo then joins the Twilight Brigade in order to learn more about Ovan. Eventually, after Ovan disappears for an extended period of time, the Twilight Brigade is disbanded and Shino is PKed by Tri-Edge. Obsessed with saving Shino, Haseo continually seeks power, culminating in his journey into the Forest of Pain, a new Lost Ground, where, after confronting another AI Harald, his PC body was transformed. At that point level 133 and equipped with an arsenal of incredibly powerful weapons, Haseo became the Terror of Death, a PKK, or Player Killer Killer, who hunted down Player Killers. Upon finding them, he demanded information on Tri-Edge; if they failed to give any useful information, which was usual, he killed them. The name Terror of Death was the title given to him by players, as he truly cared nothing for any other player except for Shino. Around this time, Ovan returns and informs Haseo that Tri-Edge will reappear shortly at the Hidden Forbidden Holy Ground. Haseo attempts to defeat Tri-Edge, but is Data-Drained, returning some time later as a level 1 character with no items or contact info. (AIDA- a bug in [The World R:2] that when normal players come into contact with this 'bug' they get their data altered/corrupted and if AIDA doesn't just infect the player the player will fall into a coma) (Ephitaph users- a select few with Avatars used to fight against Tri-Edge and AIDA among other 'bugs' or 'threats') (Avatar- a total of 8 creatures first seen in the original DotHack where Kite and his friend defeated them all, Avatars are now used by the Ephitaph users to 'delete' the bugs called AIDA or to remove these bugs from infected players, Avatars use a special move called data drain that when used on players with out an Avatar or AIDA inside them they will drop into a coma).